Sometimes you can look like an absolute weirdo in your art making. I think this moment was one of those instances. It looks a lot stranger than it was, but the moment in which I placed myself in among this structure and walked about a section of uni campus did allow for feelings of self-consciousness. It was interesting however to place myself within a structure I had been working with for so long. 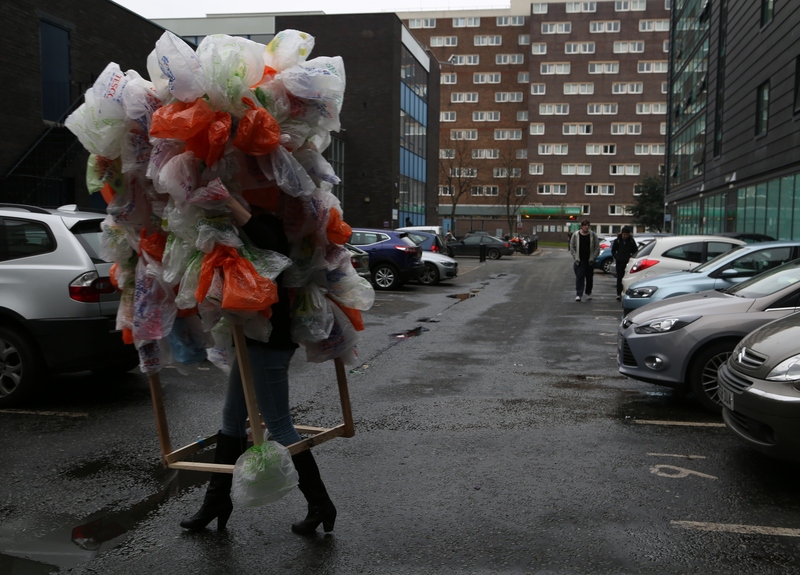 The structure is a sculptural representation of the human body; the wooden components symbolise the bones and support structures that hold our bodies upright and the bags represent the lungs and air pockets that keep us breathing. In some of my experiments I hung little bundles that dripped onto the floor with ink, as a representation of both small organs and our bodily fluids. To have worked with this sculpture as a representation of the body for so long, I had developed a relationship with both the structure and the materials. So as well as creating some interesting images and getting some strange looks doing this, it was great to physically immerse myself in the piece.